Join the Pirate Princess on her voyage across the seven seas while she searches for buried treasure and overcomes rival seafarers. Enjoy this spin slot games 5 reel adventure that’s filled with wild parrots and gold that enable you to uncover the elusive bonus round. Eyecon is one of the leading slot game developers currently on the market after developing a substantial list of online slot games fit for distribution across the Wizard Slots platform. 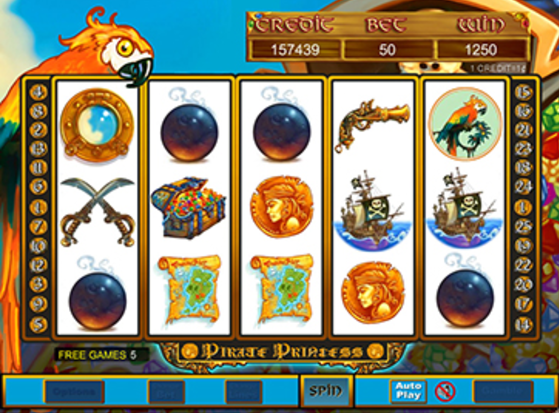 Pirate Princess is Eyecon’s finest work to date and really establishes themselves as a premium developer of online slot games. Climb up the ladder and hoist yourself onto the poopdeck to witness some of the greatest views that man has ever beheld. The views in questions are those that rest behind this wonderful game board that houses the pirate princess. The pirate princess is a seasoned sea-fairer and visibly conquered the seven seas returning with heaps of treasure. Explore 25 paylines and strategise your way through an enticing game board. You don’t need to have the treasure all ready to play online slot best games like this with the option to place bets on paylines for as small a price as 1 pence. There is a range of pirate-themed symbols that need to be matched so you can win some treasure. These symbols range from the low-paying goblet and wheel to the increasingly valuable icons such as the pirate hat and the flag. If you land the peak amount of pirate hats and flags you’re in with the opportunity of multiplier your initial win by over 1000x – This is the best return in this glorious scurvy-filled online slot game. Find the Pirate Princess symbol to substitute other symbols, this symbol trumps any other icon other than scatters. Increase the stakes by acknowledging that this slot only has three scatters; a solitary pirate ship, a treasure map, and a cannon. Find the ravenous princess and your winnings will be doubled. Be careful to land two or more symbols during each spin and ear yourself a lovely buccaneering scatter prize. If you’re a gamer who loves a bonus, then Pirate Princess has it all, enjoy the Ship Battle Pick bonus by locating the ship symbol 3 times in quick succession. For every one of these mutinous vessels, a prize will be drawn which could enable your fortunes to multiply themselves by 100. Look out for the cannon as this is the symbol that helps you get those much craved free spin bonus symbols that occur when the cannons destroy the escaping reel ships. Reel in your treasure map and open the ‘match and win’ game where you must contribute to a game of pairs to enable yourself to win a pirates prize. Eyecon has done a great job at creating this female orientate pirate princess classic. The game simply has everything and is worth playing for the bonus games and free spins alone. Deposit and Spin today to play one of Wizard Slots highly recommended games. Another wicked game is gonzos quest slot.